My grandson's teachers birthday is next Wednesday and he wanted me to make her a box. I was sending him pics yesterday until he finally decided on this style. I'm pleased with how it turned out. Wow! That is Gorgeous. Great paper choices too. Love it. You are JUST pleased????????? ?I would be ecstatic, it is so beautiful she will be blown away! The colors are sensational together and the rose on top is gorgeous!! Keep those creative juices flowing!! Super gorgeous and so unique! Love it! Hi Nana!This is GORGEOUS!Stunning!Beautiful!WOW!! !I love it!just to update you...LOL...my Bday is in June...LOL...it really is beautiful! Oh wow! How cute is this? 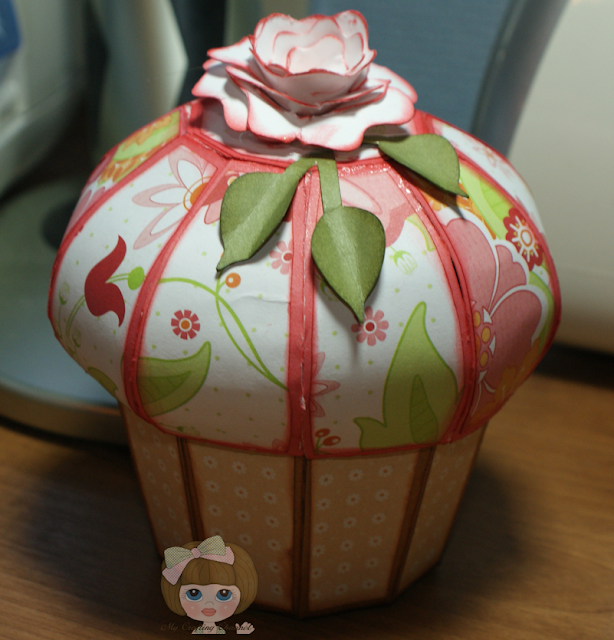 Love the sweet papers you used and the flower on top - simply adorable! I absolutely love this Nana, I got one for my birthday from Karen--- This is the coolest cut ever -- I am really tempted to get a machine that cuts SVG's-- I would love to have this file-- and be able to cut it. Nana, this is beautiful. I love all the inking to highlight the panels. Perfect choice on the papers! WOW, Nana, this is gorgeous!! I love the beautiful design and the papers you used!! The flower is stunning!! What an fabulous gift!! Wow Nana, this is gorgeous, I like the papers you have used. This is BEAUTIFUL!!!! Love the design and papers! Wowza! So pretty!The flower makes it! 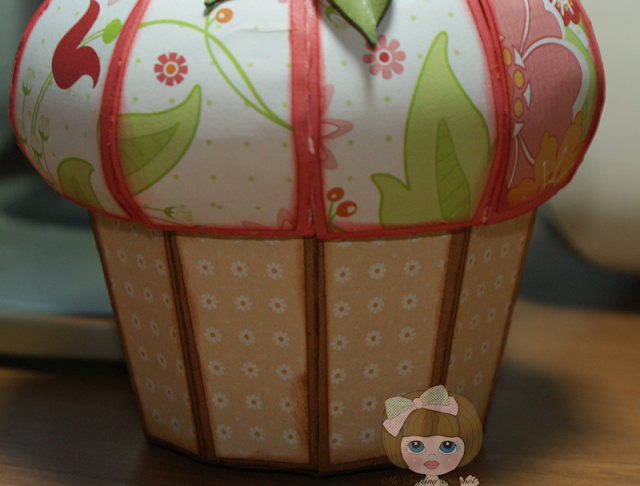 Such a great cupcake box! Love the papers ! I LOVE this cupcake!!! One of my favorite 3d projects!! Yours turned out gorgeous!! Great papers and colors!! LOVE the flower on top! This is amazing! You are so super creative. I would never be this imaginative. Great job! OMG, I love it!!! Your box is amazing and turned out great! She will absolutely love this special box! Oh, how cute is this---great little box and the flower on top looks so pretty!